Joe Mande: comedy giant, subtle wordsmith or annoying prankster? 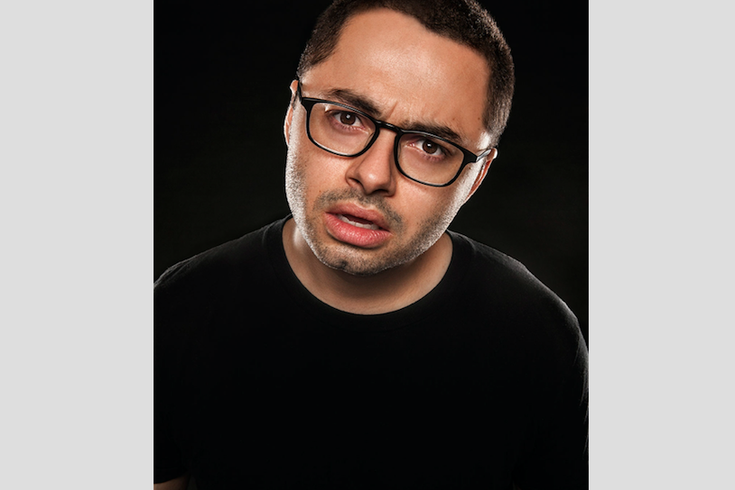 Joe Mande appears Sunday, August 13 at Underground Arts. If you’re watching Netflix’s newly-released “Joe Mande’s Award-Winning Comedy Special,” beware: this guy is not exactly telling the truth. And that’s good. For what stand-up comic/script writer Joe Mande does best – throughout what he bills as his first televised special (it’s not) – are humorous stories with long setups and elaborate details. Only “Twin Peaks: The Return” compares when it comes to the attention that you must pay to Mande’s scheming. “Yeah, I think that I might have been a bit of a troublemaker growing up,” he said. You wouldn’t know that Mande was so obstreperous from his output as a television writer. Within the decade, he’s written for quirky, wordy comedies such as “Kroll Show,” “The Good Place,” “Parks and Recreation” and “Master of None,” among other programs, while also guest starring in these same shows. To hear him say it, such communal writing is a comfy gig. It was a great transition that Mande made from being a university-age stand-up to an adult script writer to a stand-up again, as he learned about what he “didn’t want to be” early in his career. Mande found his true talents in the slow burn: the long complicated tale with subtle nuances and set ups whose weird twists might be false, yet could be real with just a few, smart details. “I just went to what was more natural for me, which was that long-form storytelling,” said Mande. That’s where Netflix’s newly-released “Joe Mande’s Award-Winning Comedy Special” comes in, a show where Mande truly doubles down on his long-form tall-tale telling. During its mix of docu-dramedy and stand-up, Mande creates, what he hopes, is a winning comedy set so that he can win the heralded American Humour Award. This prestigious comic accolade has already been achieved by such illustrious comics such as George Wallace and Bo Burnham, both of whom appear in his Netflix special. There’s only one problem: there is no such thing as an American Humour Award. Burnham and Wallace won nothing. Yet, Mande is so convincing as a writer and as a performer with an earnest face and demeanor, I was pushing for him to win. And now I feel stupid. “Prank-wise, I don’t want to humiliate people, but rather just tease them,” said Mande. Another major aspect of his stand-up routine – a la “Joe Mande’s Award-Winning Comedy Special” – is that Mande seems as if he’s selling his audience something. This salesman’s self-help element is not unlike a comic TED talk that he’s used in the recent past when creating a Kickstarter for his hopeful “Million Dollar Podcast.” Mande said he “drunkenly” created the crowdsourcing showcase to make light of the complicated world of commerce and art. “Those things interest me, which is probably why I picked on the prestige of award shows for the Netflix thing,” said the comic. Joe Mande appears Sunday, August 13 at Underground Arts, 1200 Callowhill St. Tickets are $18-$15. Show time is 9 p.m.. For more information, call 215-627-1332 or click here.